Coburn Goat & Sheep Stalls are pre-assembled and ready to attach to your floor or milking platform. Stalls are made of galvanized steel and feature individual self-locking head gates with gang release. These stalls combine well with our Porta-Milker bucket milking systems. Order units individually or request a quotation on a complete system. ORDER (3) UNITS AND GET A BULK DISCOUNT. Scroll down for more complete information. This item does not ship for free...please choose "Freight shipping" when you check out and we will get back to you with a quote. 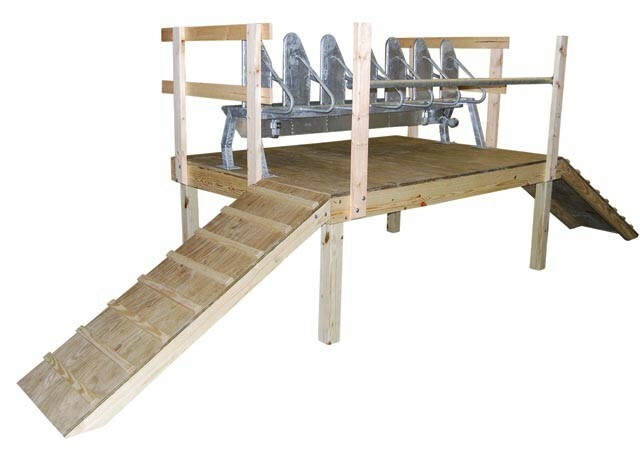 Coburn Goat & Sheep Stalls are pre-assembled and ready to attach to your floor or milking platform. Stalls are made of stainless steel and feature individual self-locking head gates with gang release. These stalls combine well with our Porta-Milker bucket milking systems. Order units individually or request a quotation on a complete system. When choosing an entry direction for your goat/sheep stalls, keep in mind that the left entry allows entry with the stalls to the left of the animal, the right entry allows entry with the stalls to the right of the animal. Headlocks are made for right entry or left entry. If your animal will turn left when entering the headlock, choose left entry. If they turn to the right, choose right entry.